Big, capable and thirsty, the Tundra doesn’t hold back when it comes to competing with the North American half-ton trucks. The latest generation of Tundra shows that Toyota doesn’t want to be seen as a 7/8 version of a half-ton truck. They are going all the way. It is certainly more masculine and chiseled than ever before. Its handsome squared-off looks, combined with manly touches like the Tundra name stamped into the tailgate and the gargantuan grille make for a formidable-looking beast. It sits on massive 20-inch alloy rims, in this case shod with 275/55-sized rubber. In my opinion, it’s the best looking Tundra yet. The Tundra’s interior is spacious and relaxed, and it seems as though everything was given plenty of space. You’ll find acres of hard plastics on the dash (much like most of the competition). Ergonomics are decent and the styling is kept simple. The heated leather seats are very comfortable and power-adjustable. You’ll find an excellent driver information screen between the main gauges. Many of the main controls on the centre stack are very chunky, which allows you to use them while wearing gloves. The 7-inch touch screen is a bit of a reach for someone my size, but overall it works well. The system manages your audio, phone, navigation and vehicle settings. The rear seating area has three seats, and as you’d expect in a modern pick-up, there is a ton of room. You can easily accommodate three adults here, and they’ll have room to stretch out. Head room and leg room are more than generous. Rear passengers get adjustable air vents, a 12V plug and an armrest that folds down out of the middle seatback. Our three kids fit with room to spare obviously, and were very happy back there. If you need them, you have two sets of LATCH anchors for little people seats. Need to move some big things, but don’t want them in the truck box? The rear seat cushions fold up and out of the way (in a 60/40 split), creating a massive open cargo space with an almost flat floor. This is very convenient for moving a lot of stuff. The rear window is powered, allowing it to vertically slide open (and out of the way) – very cool! Many of the half-ton trucks on our roads are posers for 95% of the year, and only see real truck action during the two weeks they tow the RV to the mountains. But there are also plenty of trucks working full-time alongside their owners, acting as a mobile office and a daily workhorse. From an interior perspective, this means the truck needs places to put stuff, and conveniences to assist the working person with normal working tasks. The Tundra gets a big glove compartment, good door bins, and an organizational space at the front of the centre console where you’ll also find two 12V plugs (and the USB and aux inputs). There are little smartphone-sized drop-in bins – one on top of the dash and on top of the armrest lid. Speaking of the armrest – pop the lid open and there’s a massive open space under there (with another 12V plug). When it comes to staying hydrated and caffeinated, there are three cupholders in the console. I would definitely wish for some 120V household plugs, yet there are none to be found. The competition offers them, and frankly the old-school 12V plug should be headed toward extinction. In terms of payload, the 5.5-foot box seems well-designed. Toyota adds a very bright utility light, and the tail-gate gently lowers itself once you open it – definitely a nice touch. The adjustable tie-down hooks (two on each side, situated on rails on either side of the box) are fantastic, and they complement the stationary tie-down loops found elsewhere in the box and make load management easy. The Tundra’s towing package includes a hitch receiver and both sets of trailer plugs, as well as wiring for a trailer brake – but you’ll need to use a third-party trailer brake unit. The Tundra gets a big, brawny 5.7-litre V8. It puts out big numbers: 381 horsepower at a somewhat-lofty 5600 RPM and 401 lb.ft of torque, available at 3600 RPM. There’s a 6-speed automatic transmission and an electronically-controlled 4WD transfer case. Nobody buys a half-ton truck with a V8 to save on fuel, but even for a 2575 kg (5677 pound) 4×4 truck, I found it to be a bit thirsty. The Tundra (in this configuration) is rated at 18.5 L/100 km (13 US mpg) in town and 14.2 L/100 km (17 mpg) on the highway. So on that note, I actually beat the vehicle’s rating, averaging 16.6 L/100 km driving as economically as I could. If you’re expecting anything than a truck that feels big and substantial, you’ve come to the wrong place. The Tundra IS big and substantial, and it feels like it. The awesome-sounding rumbly V8 pulls strongly off the line, and I never wanted for more power around town. It’s torquey and its smooth. The smooth transmission definitely heads for the higher gears quickly to try to save fuel (a mission the truck obviously doesn’t succeed in). Should you need to, you can shift the gears manually and there’s a hilarious Sport mode, which responds slightly quicker and hangs on to gears longer – I don’t think it’s going to make things any sportier though. The Tundra brings its A-game when it comes to the ride. It is outstanding – luxurious and well-controlled with little of the wallowing around corners that one expects from a truck, and it soaks up big hits on and off road, letting nothing come through to the cabin. The Tundra is quiet too – road noise, engine noise and wind noise are all nicely dampened, even at highway speeds. 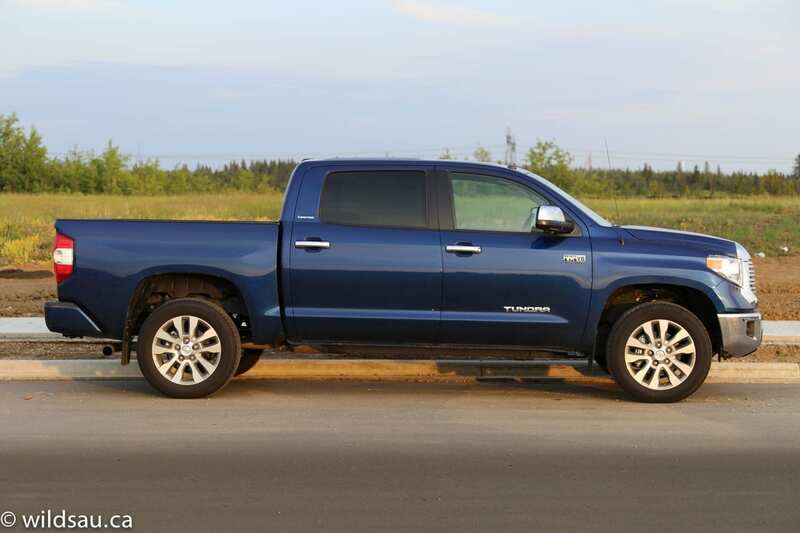 Toyota rates the towing capacity of this configuration of Tundra at 9,490 pounds. I’ve helped move a big boat on a trailer (an over 5,400 pound rig) with another Tundra sporting the same drivetrain. Off the line, the Tundra felt very powerful and continued with nice, linear power delivery right up to 105 km/h. I tried towing with and without the tow-haul mode – it definitely made a difference and seems to be very effective. The truck felt level and stable, and the brakes were powerful and quick. Overall, I found it to be very easy to drive while towing. I’ve read of complaints regarding previous-generation Tundras that feel like the frame flexes and twists while towing loads – I did not get that sensation. I would say the Tundra has all the power you’d ever need in a half-ton truck when it comes to recreational or work-related towing. Rear-wheel drive, 4HI and 4LO are accessed with a rotary dial on the dash – I did not have opportunity to test any 4-wheel drive modes this time around. Parking anything this size is never fun, but the Tundra’s driver assistance technology (front and rear parking sensors (with audible and visual aids) and back-up camera make a big difference. Backing out of your parking spot or driveway is a tad less stressful too, courtesy of the rear cross-traffic alert system. And once you’re on the freeway or highway, the blind-spot monitoring system is a welcome help when changing lanes. The Tundra has been with us for quite a while now. It’s a good truck. It does a lot of things very well, and it has proven itself to be epically reliable in this class. It will certainly hold its own in terms of on-road performance, it has decent off-road chops for a full-size truck (equal to the competition) and it has what it takes to be a work truck. There are a few oversights that surprised me, but if you were to buy this truck, you wouldn’t be disappointed and could likely count on a rewarding ownership experience. Toyota’s challenge continues to be that of convincing buyers that it is a legitimate contender in the marketplace. It is a contender, to be sure, but truck buyers are often stuck in their ruts.